I’ve been debating for a while how I’d like to review this game. There are so many different ways to describe it, but at the same time, none of those descriptions are set in stone. Because while the Pathfinder Core Book is a wonderful guide, it is just that; a guide, and may or may not be used as desired. Let me explain what I mean. The Pathfinder role playing game is based off of the rules and core design of Dungeons and Dragons, specifically the 3 and 3.5 rules set. You might be wondering how Paizo can do this without incurring a lawsuit; don’t worry, it’s cool, all the legalese has been resolved already. 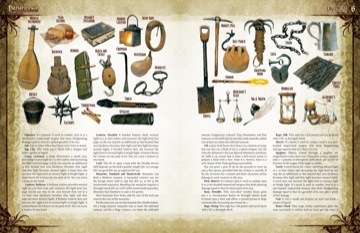 In fact, I’m glad Paizo was able to do so legally, as the final product they produced feels much more simple and streamlined than the Dungeons and Dragons version. Strength: Affects how well a character can attack and hit enemies with melee attacks, how much damage they can inflict, and how well a character can accomplish tasks related to brute force. Dexterity: Affects how a character attacks with ranged weapons, determines how hard they are to hit, and affects tasks requiring finesse or delicate movements. Constitution: Affects a character’s health as a measure of how sturdy they are, and shows how resistant they are to sickness, poison, disease, and other physical maladies. Intelligence: Affects a character’s ability to learn and improve skills by way of skill points, and can grand additional spells per day for some magic-users. Also affects skills requiring intellectual acumen. Wisdom: Affects how a character is able to resist attacks or situations that affect the mind, and can grant additional spells per day to some magic-users. Also affects some skills related to instinct and general survival. Charisma: Affects a character’s ability to lead, negotiate, and improve overall reactions, and is an indicator of overall attractiveness. Affects skills related to influencing others, and may grant additional spells per day to some magic-users. After attributes are assigned, players will select a race for a character to be. There are a number of options (like humans, dwarves, elves, and even half-orcs), and each race offers certain benefits and disadvantages to consider. Players further customize their characters by selecting a class for that character to be; classes are a character’s chosen vocation, and largely determines what a character will be capable of during the course of an adventure. A Fighter, for example, is good at managing weapons and armor, and acquires a lot of natural physical talents in being able to fight enemies and protect the party. A Cleric is not as talented as a Fighter in combating enemies, but can wield divine magic, and possesses the ability to channel positive or negative energy, which can heal or harm creatures respectively. A Wizard possesses little in the way of combat skill, but can gain access to arcane magic, which can be both incredibly useful and massively destructive. Once class has been selected, players select feat(s), which are special heroic talents that are difficult for the average person to learn, like being able to wield exotic weapons or fire two arrows at a time. Characters then get assigned equipment according to their starting gold values, catalog any spells they know (the core rulebook has a HUGE selection of spells), and then your character is good to go. Complicated? A little. Character creation in role-playing games is almost always a big deal, but it’s also kind of nice to be able to see what goodies you can get. Pretty much everything you do when using your character in a game is determined by a roll of the dice. Numerous dice are used in the course of playing a game, but most often, players will be rolling a 20-sided die to determine success. A target number will usually be assigned to beat with that roll, and the roll itself is modified by whatever bonuses or penalties you have at the time. The result determines success or failure, and the Gamemaster (or dungeonmaster) will let you know what happens from that point; the Gamemaster is someone who sets the stage for the rest of the players to adventure in. In some situations (like combat), a roll of a natural 20 is considered and automatic success (with a chance to critical hit), and a roll of 1 is considered to be an automatic failure (with a chance to fumble for a bad result). What I’ve just discussed is the basics for creating a character and general play, but tells little of the Core Rulebook itself. How does Pathfinder tie into all this? Well, the Core Rulebook contains everything you need to get started with the game, and much more; the book details everything from how certain skills work in certain situations, what is required to make spells work, tips on traps and how to create non-player characters to flesh out a campaign, and even weight encumberence tables to gauge how much your character can carry. Does it seem like too much? Don’t worry. All good role-playing books (like this one) remind the players that these rules are GUIDELINES ONLY. You can choose which rules you want to use and which ones you want to skip. Want to ignore the need for spell components? Go right ahead. Toss encumberence rules out the window? Why not? Need to keep you party members fed? You can just imagine that players are able to fend for themselves. It’s as real as you want to make it (with some exceptions, of course), and if you want to apply weather effects or have a subterranean mission, all the rules are there if you want to use them. And that’s pretty nice. The rulebook is large, but easy to understand, so you can bet that you will get good value for your money for what it offers. Paizo is also VERY good about offering supplements or additional information, so they’re not going to be going anywhere anytime soon. As a player who has played.multiple role-playing games, I say, give this a shot. I always look forward to my next gaming session, and I’ll be rolling the dice soon enough. EDIT: This review doesn’t cover the other books in the series, like the Bestiary (contains all the monsters you might need to present the PCs with a challenge), the Advanced Players Guide (presents more options for classes and some variants to existing ones), or the Game Master’s Guide (extra info for anyone who wants to run an expansive campaign). But all are equally easy to read and contain a wealth of information that makes the Pathfinder series an enjoyable one to partake in. I am a boardgamer at heart, as I have made board games a serious hobby for the last 30 years, but have not played any RPG’s in almost 20 years. My experience with Pathfinder at a recent gaming convention is causing me to reconsider. I’ve tried D&D and many other role-playing games and never cared much for them after the first adventure. For several reasons, I found Pathfinder to be a much different experience. I wanted to try this game based on the glowing reviews I read on boardgaming.com. For me, this game lived up to the hype and I was not disappointed. I can’t wait to play Pathfinder again. While the theme of the game is far from original, there are plenty of nuances in the game to set it apart – in a good way – from the competition. The player classes give you great options and it is easy to customize your character. You can choose to represent different factions (which each have their own agendas) which opens up the opportunity for bonus prestige points. The prestige point mechanism is a superior alternative to the clunky, number-crunching experience point mechanism found in other RPG’s. Pathfinder in general makes the game about the story, the characters, and player interaction which has a strong appeal to a boardgamer like me. It’s not so heavy on the die-rolling and most die rolls are based on a d20 roll with one or two modifiers that are easy to keep track of. As a boardgamer, I have no interest in carrying around several tomes of rules, bestiaries and other nonsense in order to participate. I had the luxury of good GM’s and a couple of experienced Pathfinders to help remind me what dice to roll for my spells and damage. All you need to have fun with this game is a set of dice, pencil, paper and your imagination. I can’t say enough good things about this game. I would strongly recommend it, even for people like me who normally steer clear of RPG’s. Pathfinder is based off of the old, D&D 3.5 ruleset. As such, it does offer players a wide variety of customization options and such. The problem I have is that, compared to 4E D&D – the game is relatively confusing for new players in terms of character development. I had some difficulties putting together a character because the rule book itself is not terribly clear in some places, and the system is just not very intuitive. I found myself looking at different characters created online to try and reverse engineer the process a bit. Furthermore, I find that although characters have plenty of customization options – I feel personally that most of the characters seem more or less the same, and kinda flat, at the beginning stages. In 4E, you could have two characters of the same class play very differently – whereas in 3.5, the mechanics are relatively the same and their is a lack of actual ability to be had. With that said, the game does provide some interesting mechanics for the different classes they have, and truth be told I actually wish some of the class ideas from this game were in 4E D&D. The art work in the book is, in my opinion, gorgeous. All in all, the game’s not bad – but if you’re newer to PnP RPGs like I am, then you definitely will want to have an experienced player around to help guide you in the process, something I just did not have. While I may favor 4E rules, the 3.5 rules do still provide some fantastic things for people who are wishing to try something different. Great RPG with tons of fun. I’ve followed D&D since 1st edtion, playing 2nd, 3rd and 3.5 most. 4th edition was a mess for me making the game a pen and paper MMO-ish disaster. This is what WotC should have done for 4th edition instead. As a fantasy rpg Pathfinder gives you every posibility of playing your chosen (and customized) character exactly the way you want. You have the option for deep roleplaying, heavy tactics on the battlefield, powergaming, character optimization or a mix of all of these – chosen by players or the Game Master. I’ve only played the Kingmaker campaign so far. We’re into the last book, of a total of 5, and have a party of 4 level 13 adventurers. That said, we have decided to only play with the 3 core books next adventure. Now we’re using core + advanced players guide (APG). Our GM has removed a few quite overpowered feats like Point Blank Master (APG) which alows you to fire bows in melee range. This to make the game flow easier and make it a bit less complex. There are a lot of additional content which is fun to look into, but in our opinion a little to much to handle for both players and GM. I love this game and will recommend it to anyone who like roleplaying, character planning and building, tactic and strategic fighting! While this is not a storyteller’s type game, it has all the elements to make great stories and great characters. Very comprehensive core rulebook and is pretty much all anyone would need to play anything, including the game master, except for some monsters or additional storyline that can be found in a few other products. The development is deep and has it’s roots in Dungeons and Dragons, but has not taken the detour that Wizards pursued. Lots of detail if you are wanting it, but many things are easy to work in later for newer players. If you like creating characters, this is a fantastic system for you, but be warned, you’ll create a lot and you’ll constantly have ideas for more. The map is awesome and I am lucky to be able to print mine out at 42″x68″! (Ok, so that is not included in the Core but it reminds me of the game constantly). There could be more flavor in some of the text like some other systems provide, but you wouldn’t be able to pick up the book if it did. Overall an excellent investment. If you are lucky, you’ll be in a town where lots of other people play and you now have all you need to succeed! As someone who never played D&D, or any other pen and paper RPG, I found Pathfinder very easy to understand and play. I had the help of some folks that had played other RPGs, but their knowledge actually seems to hinder things. With it’s great set of resources, outstanding society play, and intricate details, Pathfinder is a great gateway game into Pen and Paper RPGs. I bought my first copy as a PDF, and have never looked back. I play several times a month, usually with society play (strangers at the store) or with my core group of gaming friends. I would recommend Pathfinder to anyone that wanted to try D&D as a kid but never got around to it, or wanted to see what the fun of Pen and Paper RPGs is all about. It was an easy step for me from MMROPGs like Warcraft and EverQuest. As a former 3.5player I will say this- (PF=3.75) It’s just like 3.5… but better. PF cleans up a lot of the slop that 3.5 just couldn’t take on after the 3rd edition bomb went off. Let’s face it 3.5 was a fix to third edition…. Now Pathfinder is the beautification to 3.5. It’s easier to understand, looks better, just as adaptable to any kind of campaign, AND I DON’T HAVE TO FIND A GRAVE TO DIG IT OUT OF!!! This game is a blast, currently being printed and updated. This is a great game for beginners and a nice shot for you grumpy old toots! As a brand-new RPG user, I must say PF brings an easy-to-learn mechanic to what it is. I hardly had trouble filling out my character’s sheet with the stats and when the campaign started everything was crystal clear. My group is fairly new to PF but we didn’t had any troubles with the rules. If your GM is a seasoned player, I don’t think he will have troubles picking this one up and run a successful campaign. A great game I can play with my kids. The game is easy to learn and there are tons of resources. If you shied away from D&D you gotta try Pathfinder. I started with the starter box and played with my son and a friend and now my son want to play all the time. The prices are reasonable. It is now easier to be a player or Game Master. I have signed up for more events at Gen Con and look forward to the Pathfinder get together. Its always a good sign of a game when a group puts together a get together to hang out with players the night before the con starts. I just discovered pathfinder and i completely “changed my alignment” from D&D 2.0 to it!! This is the go to fantasy rpg for my local gaming group. Lots of race and class options to customize your character and improve role playing. If you like fantasy rpg’s but were completely turned off by 4th edition/miniatures combat game (like a lot of people!) and have played out 3.5, Pathfinder is a great option. 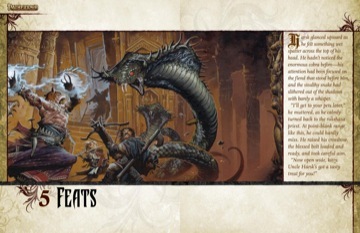 High quality artwork, very intuitive PHB and lots of supplements to compliment the core game. Almost perfect mechanics for both combat and role playing opportunities. I had thought for sure that the adoption of D&D 4th Edition was the final nail in the coffin of a once great gaming franchise. Thankfully Paizo has created a RPG to fill that void. Without embracing either the senseless complexity AD&D 2nd Edition or the simple stupidity of the current incarnation, Pathfinder manages to salvage the best of the D20 system and add a level of personalization that was sorely needed. this is my favorite rpg! if you loved D&D 3.5, you love pathfinder. all there products are great. i play pathfinder twice a week. my group uses all the books as they come out. i am playing as a gnome alchemist in one game, and a human druid in another. one of the best things about this game is the adventure support. paizo puts out a monthly magazine that is about half adventure, and the are written as campaign arcs in 6 month blocks. we are currently playing in the carrion crown adventure path. a fexible and enjoyable system. The game offers massive scope and covers everything the GM and players can want. Personally consider it as the D&D with out the ****. Plenty of expansions available, yet they do not mean that they are required. The syste allows for a take it or leave it attitude to the expansions. i’ve play 2ed dnd before. this has been alot of fun for me to play and get into. for those that like the older dnd rules simply and nice this is the next rpg for you. 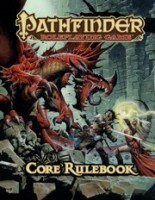 Add a Review for "Pathfinder: Core Rulebook"